One of my resolutions for this year was to visit the remains of the London Mithraeum and also see the items that were found there and are now in the Museum of London. I probably should have checked on the status of the Mithraeum before writing that resolution, because for the past few years the whole site has been behind a security fence. 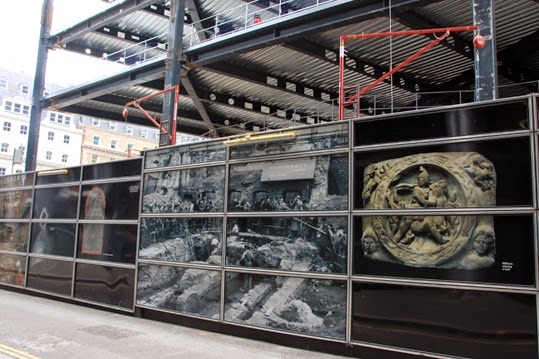 As well as building work for new offices, part of the work going on behind the fence involves archaeological excavations for the Walbrook Discovery Programme, investigating the edges of London’s underground river, the Walbrook. However, I did get as close to the site as I could – and took the photos you can see above and to the right. The hoardings offer a few tantalising images from history. The site was discovered in 1954 during construction work. It was excavated by W F Grimes, director of the Museum of London at the time. He had apparently hoped it was an early Christian church, but soon realised it was built in the mid-3rd century and dedicated to Mithras, god of the sun, justice, contracts and war. It also held statues of several other deities that were presumably venerated there. 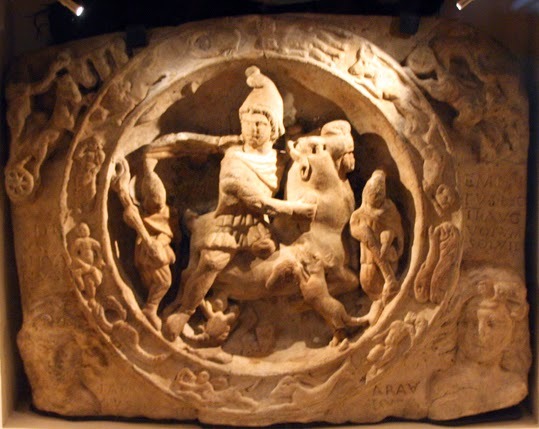 Mithras was a Roman version of the Persian god Mithra. He is often depicted slaughtering a bull – but the second most common scene found in Mithraic temples shows Mithras banqueting with the sun. One theory is that the Mithraic mysteries were to do with life, death and rebirth and were associated with the return of the sun at Midwinter. According to M J Vermaseren, the Mithraic New Year and the birthday of Mithras might have been celebrated on December 25, a few days after the Winter Solstice, when the days are just starting to get noticeably longer. Archaeologists found that the London Mithreaum was rededicated to Bacchus, the god of wine, in the early fourth century. Bacchus is yet another deity whose birthday is thought to be at around the time of the Winter Solstice. The London Mithraeum is currently not only behind a fence, but is also not where the Romans originally built it, on the east bank of the Walbrook. 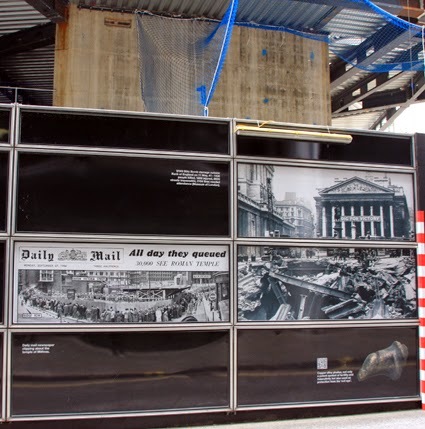 After the 1954 archaeological dig the whole temple was moved down the road to Temple Court, Queen Victoria Street, London EC4, where it was reassembled and put on public display. There are plans to restore the Mithraeum to its original site, and a projected completion date of 2016. In any case, once all the work is done people will again be able to go and visit the remains of the Temple of Mithras. After being slightly disappointed that I couldn’t wander around the Mithraeum, I went to the Museum of London and saw the artefacts from the temple that are on display there. It is a pretty impressive display too. 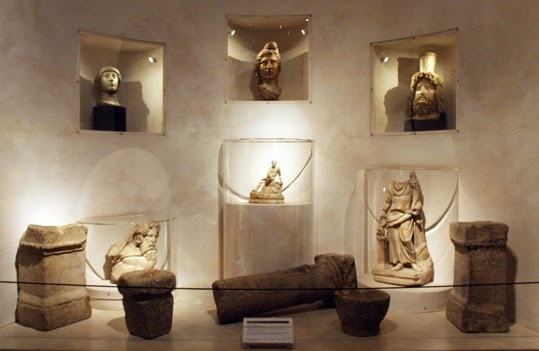 In the photo below, the statuary from left to right along the top is: head of Minerva, the Roman goddess of wisdom; head of Mithras; head of Serapis, Egyptian god of the underworld. In the centre there is a statue of the god Mercury, who guided the dead into the afterlife. On the floor to the left is a statue of a river god – perhaps representing the Thames. On the floor to the right is another statue that might represent the spirit of London. The plaque in the photo to the right shows a bull slaying scene surrounded by the signs of the zodiac, the sun and the moon. There’s a lot more information about the Mithraeum and the pagan gods and goddesses of Roman London at the Museum of London and it is very much worth a visit. I plan to return to the Mithraeum when it finally reopens to the public. There will be photos.